It’s one thing to say, “Children are our future.” It’s another to be guided by this statement to take action and marshal resources to create the emotional, educational and financial infrastructure that supports children in getting what they need to succeed in life. A nation deeply connected with the reality that its future belongs to its children would prioritize the resources that help families provide a solid foundation for their babies and young children. So how is the United States serving its 12 million infants and toddlers? For the first time, a careful, in-depth state-by-state report card answers that question in unambiguous detail. 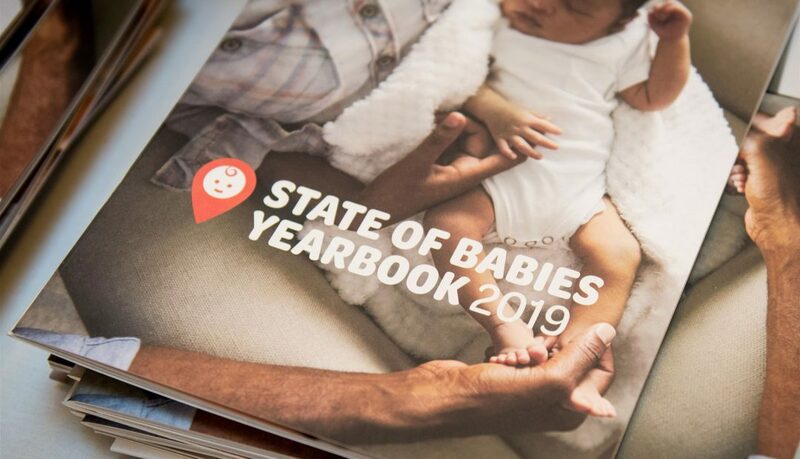 The State of Babies Yearbook: 2019, a collaborative effort between ZERO to THREE and Child Trends, is a first-of-its-kind resource that provides a state-by-state snapshot of how babies and their families are doing. Backed by Child Trends’ analysis of 60 population-based metrics, the Yearbook reports on each state’s individual data to provide lawmakers, families and advocates the reliable data needed to craft policy that addresses actual needs rather than hunches or best guesses. One of the Yearbook’s most powerful revelations is that the state a baby is born in makes an outsized difference in the child’s chance for a strong start in life. Babies in every state face different circumstances that affect their development, but the unavoidable fact this report reveals is that inequality begins at birth for babies in the United States, and some states are doing much better than others at meeting the requirements for a strong start. Because low-income families rarely have the resources to move to a state with better resources, the child’s birth state becomes one of the greatest influences on the start that child will have in life. The Yearbook’s rollout launched in February with a policy forum in Washington, D.C. with both Republican and Democratic lawmakers in attendance. A panel of advocates and administrators from several states spoke about how they use data and specifically how the Yearbook will be used to reach families and serve children—particularly babies—better. ZERO to THREE hand-delivered the Yearbook to every office on Capitol Hill, and its advocacy network sent more than 600 email messages to Congress, sharing the Yearbook and its data with their Members of Congress. The presence of representatives from both political parties is an essential piece of ZERO to THREE’s deployment strategy for the program. 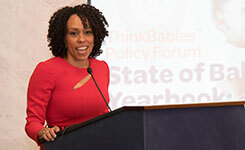 Babies should always be nonpartisan, Jones-Taylor says, and by setting them up for success, we set up our entire nation for success in coming decades. The Yearbook’s data provides a blueprint for where to put energy and resources to transform the inequality into an equitable beginning for all infants and toddlers, not just those lucky enough to be born in a state where things are working well. Research shows that babies’ brains grow fastest during their first three years than at any later point in their lifetimes, making connections that form the foundation upon which all later learning and development will rest. This brain development depends on multiple inputs, from relationships and social interactions to basic needs such as secure housing, having enough to eat and personal safety. The unrelenting stress of a precarious daily existence can keep a family from providing its infants and toddlers with the nurturing experiences they need to thrive. Rather than ranking states’ measures as worst-to-best, the Yearbook takes a more nuanced approach that ensures statistics that really count. States are tiered as, “Getting Started, Reaching Forward, Improving Outcomes or Working Effectively,” and the categories that comprise those assessments provide a clear picture of what’s working and what could use more attention. The approach to this system is strength-based, Jones-Taylor says, so advocates can see a meaningful assessment of each state’s situation while not slipping into hopelessness or despair. “The fact is, no state is serving all infants and toddlers and their families perfectly,” she says. “Even the states in the top tiers have room to grow. Every state has a handful of areas where they can do better for babies. So far, the Yearbook and related resources have been downloaded more than 9,500 times and StateOfBabies.org has received almost 106,000 page views. ZERO to THREE posts about the Yearbook, most with the hashtag #stateofbabies, earned more than 1 million impressions, and tweets from others earned 1.4 million more. Though some of the more challenging and entrenched issues can seem daunting — homelessness, violence, addiction — some remedies are close at hand and relatively simple. “One thing that really surprised me was the number of infants and toddlers who are being read to on a regular basis,” Jones-Taylor says. “It’s 38 percent nationally, which means that the overwhelming majority of children are not being read to. And that number goes beyond the low-income figures, so it’s children along the economic spectrum. Though babies can’t vote, their parents can, and ZERO to THREE created its Think Babies campaign to make the future of every baby our national priority. To raise their voices and let legislators know how much their policy decisions matter to families, Think Babies sponsors a most unusual lobbying event each spring. Strolling Thunder: Pushing for Change brings families together to visit their members of Congress — diapers, bottles and babies on board — to promote policies that support children. This year, families will be able to share the State of Babies Yearbook: 2019 with their state’s representatives to walk them through the specific areas that would make a material difference for families in their state. For more information on the campaign and to check out easy-to-manage action steps to spread the word about babies, go to ThinkBabies.org. Jones-Taylor said she thinks the failure to read to children arises primarily from a misperception that learning begins at 3 or at 5 or whenever the child starts school. Science has proven what many parents have already observed: learning begins at birth. Children are learning-and-wondering machines, eager for input. Another improvement that has been shown unequivocally to make a difference in the lives and futures of children is Early Head Start, the gold standard in supporting infants, toddlers and their families, she says. 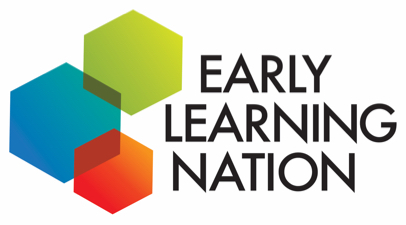 The federal Early Head Start program was created to help mitigate the disparities caused by poverty by supporting the healthy development of expectant mothers, and low-income infants and toddlers. Unfortunately, only 7 percent of U.S. children who are eligible for the program now have access to it because of funding issues. If a state seeks relatively painless ways to improve the futures of its babies, Early Head Start would be a good place to begin. Plainly, the United States has work to do in supporting its young children. The nation ranks 31st for relative child poverty among 38 economically advanced countries, with the youngest people in America living disproportionately in low-income and poor families. One in four American babies lives in poverty; 21 percent live with a single parent and 9 percent live in households headed by their grandparents. More than 60 percent of mothers of infants and toddlers are in the work force. The cultural mosaic that has always been this nation’s strength is evolving dramatically and, with more than half of babies in the U.S. now children of color, our future is certain to be more diverse than it has ever been. The research could not be clearer: the poverty and racial disparities young children in low-income families face cause notable differences in their access to resources and their chance at a solid foundation for the rest of their lives. A nation that hopes to remain creative, entrepreneurial and strong cannot afford to squander the potential of even one of these children, and the time to ensure their robust participation in its future is now. The path is clear and the State of Babies Yearbook: 2019 can show the way. K.C. Compton is a Seattle-based journalist who writes about culture, society, financial crime and risk assessment.